U.S. heiress, socialite, and philanthropist Martha “Sunny” von Bulow has died at the age of 76 after spending 28 years in a coma. The only person who knew for sure how Sunny von Bulow entered the coma, was Sunny von Bulow. It’s widely believed, however, that Sunny’s second husband Claus von Bulow was the culprit. 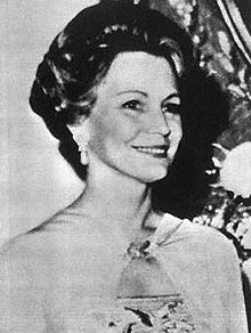 The one thing that everyone agrees upon is that Sunny von Bulow slipped into a permanent vegetative state on December 21, 1980 at her home in Newport, Rhode Island during a family Christmas celebration. The incident probably wouldn’t have gotten a second glance had it not been for a hospitalization in April of 1980 for similar symptoms and that fact that Sunny and Claus’ marriage had hit a rough patch. After the second hospitalization in December 1980, Sunny’s children from her first marriage grew quite suspicious and became convinced that Claus von Bulow injected their mother with drugs, causing the coma. Eventually Rhode Island prosecutors went before a grand jury and presented evidence implicating Claus. He was tried and convicted, but later acquitted of all charges. Martha “Sunny” von Bulow is survived by her three children: Annie-Laurie Isham and Alexander Auersperg from her first marriage to Austrian tennis instructor Prince Alfred of Auersperg, and Cosima von Bulow, her daughter with Claus von Bulow. Claus von Bulow is still alive and well at the age of 82, writing theater and art reviews in London. previous post: Bettie Page Suffers Heart Attack – In Critical Condition.